Spoons don’t get a lot of love. Moms worry about the safety of baby bottles, baby food, and breastfeeding, but they don’t give much thought to the spoons their babies use. After all, a spoon is just a spoon, right? It turns out, it’s a little more complicated than that (isn’t it always?). 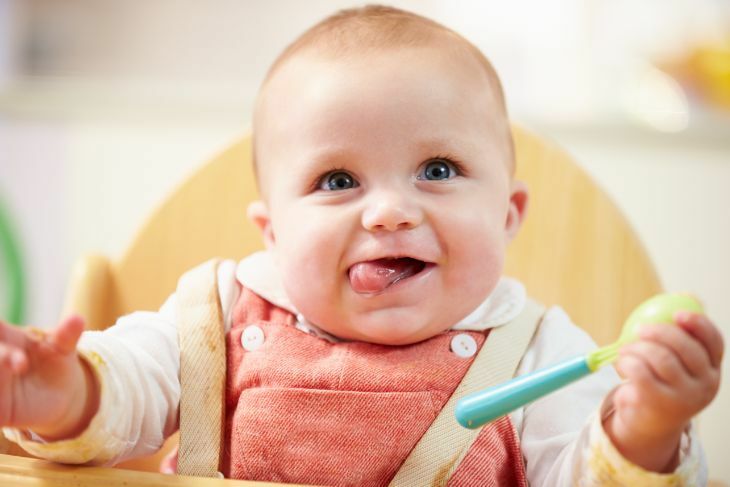 Spoons are made of varying materials, and you should pay attention to that when selecting something that your baby will put in their mouths and chew on repeatedly. Here’s all the information you’ll need to help you select the best baby spoons for your child. Use the links above to check the latest prices or read our in-depth baby spoon reviews below. Are Baby Spoons Really Necessary? What Should I Look For In Baby Spoons? When Can I introduce a Baby Spoon? When Should Babies Spoon Feed Themselves? You might be wondering if you can just get away with using a regular old steel spoon to feed your baby. After all, if it’s good enough for you to eat with, shouldn’t it be fine for a baby? Some old-school parents will shrug and say that you can feed a toddler just fine without buying yet another special tool. And it might be tempting to use that fancy engraved silver spoon you got as a baby shower gift for meal times. But most feeding authorities recommend using a shallow, plastic children’s spoon for feeding, since it’s easier for them to eat from and won’t hurt their delicate mouths. If you have an older toddler with more teeth, or you’re in a pinch because all your plastic spoons are in the dishwasher, a metal one now and then likely won’t cause any harm. That said, plastic spoons are pretty cheap, so it makes sense to have a few on hand that are just for feeding your little one. 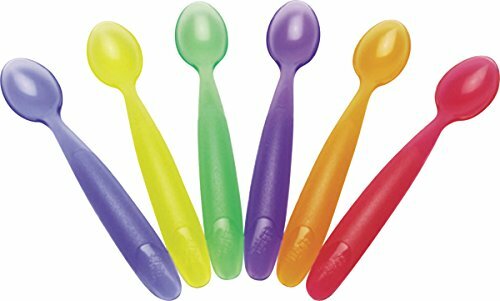 Silicone Spoons: Most spoons are made of soft, smooth silicone that can easily be thrown into the dishwasher and are safe for kids to chew on as they learn to eat. Check that they’re BPA free. Bamboo Handled Spoons: These are biodegradable and super cute to look at, with a detachable plastic spoon part that can be washed separately. Combined Spoon and Teether: Some spoons are made a little larger with a more chewy texture, for those teething kids who to bite down on as they eat. The teething element may encourage some kids to use the spoon. Shaped/Ergonomic Spoons: Little hands can be clumsy and a spoon is hard to hold. This style of spoon is usually chunkier and shaped to help toddlers get to grips with their fine motor skills. To make sure mealtimes go smoothly, you’ll want to pay attention to several factors when selecting the best baby spoons. What it’s made of: Unlike adults, babies aren’t sophisticated enough to use a spoon that has a metal end. Chomping down too hard on a metal spoon can hurt your baby’s gums (source). So you’ll want to look for spoons that have a softer material on the end for your baby, such as plastic, rubber and even wood as your baby gets older. Size: Remember, what might look ridiculously small to you is probably a perfect size for your baby. You want a spoon that is small enough to fit in your baby’s mouth. Who will be feeding your baby: If you’re still doing the feeding, the handle portion of the spoon won’t matter as much. But if your baby is starting to feed independently, you’ll want to find one with a comfortable handle for them to hold onto. Choking hazard: Some spoons have removable ends — for instance, bamboo spoons often have rubber or plastic mouthpieces that can be removed for cleaning purposes. If you opt to get this kind of spoon, you’ll need to make sure to keep a close eye on your baby to ensure the end doesn’t come off and become a choking hazard. Cost: You can buy baby spoons so cheaply, you won’t even know you’ve spent money. But I wouldn’t rush out and buy a bunch of cheap spoons if I were you. I made that mistake when I was a new mom and grabbed the cheapest pack of brightly colored spoons I could find. Within a couple of months, they were full of teeth marks, since my baby was chewing them up at every meal. The worst part wasn’t replacing the spoons, but wondering what harmful chemicals she might have chewed off. Yes, I know, fretting about baby spoons may seem like overkill, but in my experience, no effort made for the sake of your baby’s safety is ever wasted. It won’t be long before your baby grows up and starts using Big Kid cutlery anyway, so why not enjoy their baby spoon days while they last? Here are our reviews of what we think are the best products currently on the market. A spoon that works well for you to feed your baby doesn’t always work as well when your baby gets ahold of it. You’ll only spoon feed your baby for a few short weeks before they get the hang of it themselves. And that baby spoon that felt comfortable in your hand might feel too heavy or hard to hold in theirs. These spoons aren’t rigid, which makes them easier for your baby to use until she brushes up on her fine motor skills. While the necks are bendable, the handle remains firm, which will give your baby a good grip. 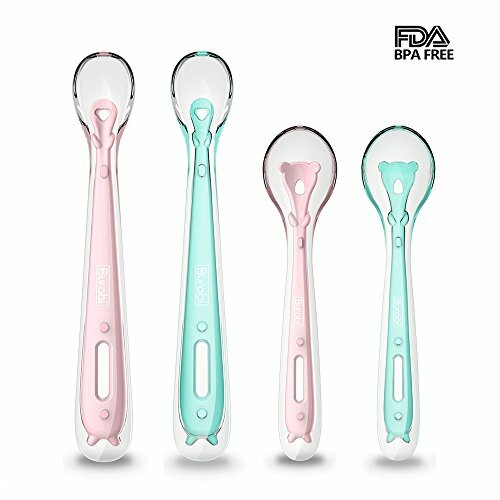 Two spoons are included in a pack, and they’re made out of BPA-free silicone. They feel soft in your baby’s hand. Because they are so soft, you won’t go crazy from hearing your baby make a repeated clanging noise by striking her spoon against a high chair when she’d rather play an impromptu instrument than eat. These are different in that they have a cutout in the scoop part, i.e., the spoon isn’t solid there. That helps your baby because if they aren’t able to scoop up baby food, at least some food will get trapped in the hole in the process. That way, they won’t get frustrated in the beginning when they’re unable in the beginning to get the scooping motion right. The food channels on the spoon help it grip the food. Helps your baby master self-feeding with less frustration. These are a bit pricey. Won’t work well for really runny foods — it’s better for purees. Moms these days are not only concerned with the safety of the food they give their babies, but also the safety of their utensils. Some women choose to steer clear of plastics because the next BPA scare could be right around the corner. Luckily, there are a lot of quality spoons out there that are fully organic or have organic components. This set is practical, but feels quite luxurious, in part because of the heavy handcrafted wooden box the spoons come in. The box makes a great container to hold the little knickknacks that seem to take over a mom’s house. It’s a nice keepsake you can use year after year, long after your child has outgrown the spoons. Theses are made of food-grade organic silicone and bamboo, so you can feel good about every bite your baby takes. The bright colors of the spoons will attract your baby’s eye, but it’s the safety of the materials that will attract yours. Each handle has a smiley face on the end, which your baby will notice when she uses them. For cleaning, you’ll need to remove the silicone heads which you can just pop into the dishwasher. The wooden handles should only be washed by hand. Although your baby would have to be super strong to pull the heads off the handles, you’ll need to supervise feeding time to make sure that doesn’t happen — you don’t want your baby to choke on the spoon tips. But that won’t require any extra work on your part because you should always be in the room when your baby is eating anyway. Top-notch handcrafted box that comes with the spoons. Safe materials for those who avoid plastic. Made of bamboo, which is a renewable resource. Can be more of a choking hazard without supervision. More expensive than plastic spoons. Let's be honest: your toddler is likely in that stage where whatever they see, they put straight into their mouths. The second those little teeth start poking through; they'll be gnawing and chewing and biting on everything, including their feeding spoons. So why not get a spoon that you're happy for them to chew down on? These spoons from Olababy not only look adorable with their chunky leaf design, but they’re also super practical. 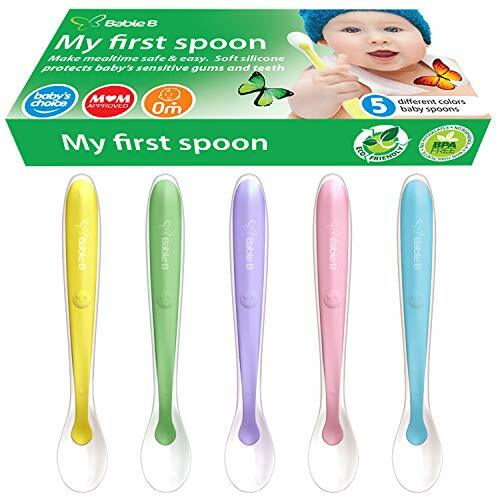 The spoon handle is flexible and ergonomically designed for small hands, plus the base makes it so you can stand the spoon upright, for added hygiene. Made of food-grade silicone, these look like toys and are a nice gentle way to introduce your toddler to self-feeding while they’re still teething. The soft, flexible tip won’t damage tender gums, and you can throw them into the dishwasher when you’re done. Much smaller than most brands, so easier for toddlers to use themselves. No staining and easy to clean. May have a slight chemical odor. Some parents find the scoop is too large and flimsy. As much as you might want your baby to remain little forever, they're growing up and will soon need more than just a spoon at feeding time. They'll eventually branch out into fork territory. You’ll need to find a fork that will get the job done without discomfort until they master how this new utensil works. They hold plenty of food and the forks are shaped just like a spork, so your baby will get some of the food-stabbing ability that a fork offers, along with the safety of a spoon. The round edges of the fork are soft, which will protect your baby’s cheeks and hands, as well as any other body part they might accidentally stab in their haste to get food into hungry mouths. The brightly-colored utensils will keep your baby’s interest and the non-slip material of the handles will allow your baby to keep a firm grip. The handles are thick, which will stop them from slipping from your child’s hands as they come to grips with this whole eating business. Perfect for traveling or at home use. A safe option for exploring the world of forks. The fork won’t pick up food as easily as a traditional fork because of the rounded, spork-like design. The littlest babies require the most care. With a smaller, sensitive mouth, your infant needs the right kind of spoon to help them build good eating habits and enjoy mealtimes. 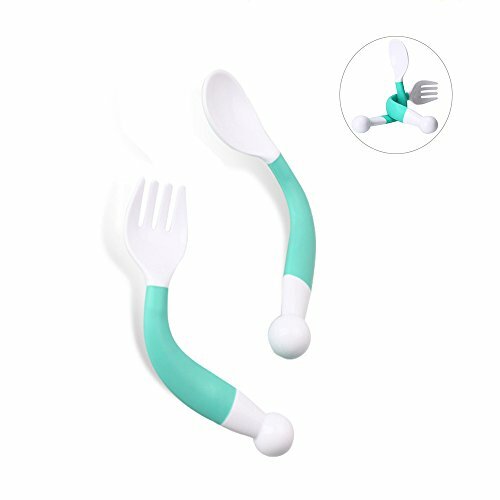 This set of silicone spoons was designed with infants in mind. 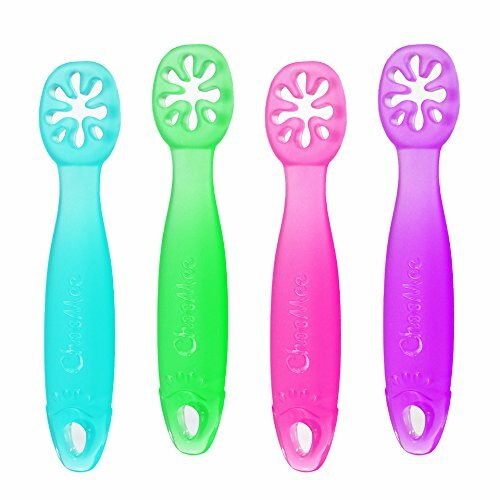 These spoons can be used as early as four months and feature gum-friendly soft silicone tips. The edges are nice and smooth to ensure there isn’t any cutting or scraping against the gums or teeth. Because the spoon is shallower than regular spoons, it holds the perfect amount of food for your baby’s tiny mouth. Unlike harder plastic spoons, these have a slight bend so you can scoop up food at any angle. As your infant gets a little older, the non-slip handle can be easily held in their chubby hands. 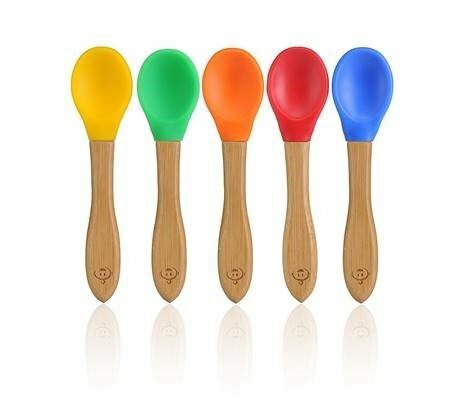 We love that these spoons help your child feel more confident and comfortable as they learn to feed themselves. 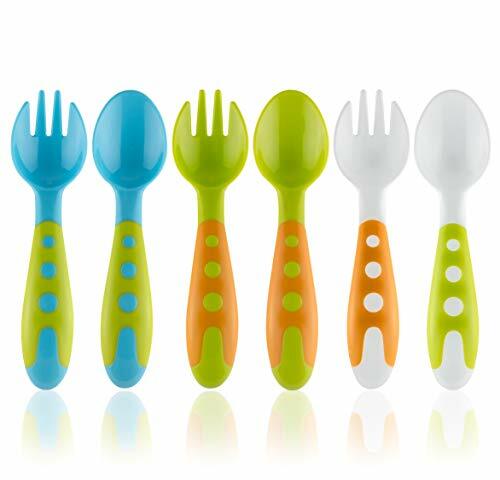 Each set comes with five brightly colored spoons. Soft silicone and shallow spoon shape is perfect for tiny infants. Can be used as your baby grows bigger. Certain foods, such as carrots, can discolor the clear silicone tips. As adults, it's hard to understand just how difficult it can be to learn to use a spoon when you're a toddler who's never done it before. If your little one is keen to gain more mealtime independence but having trouble getting the hang of things, you might like to consider an ergonomically designed spoon to ease the process. Though this spoon from Kizingo doesn’t look much like a spoon, it’s likely to be far easier to manage than a longer, thinner one. The handle is large and chunky, and angles the scoop towards your toddler, so it’s easier for them to get the food where they want it. They come in a range of colors and their curvy shape means they stay in the bowl instead of flipping over and flinging food everywhere. They’re FDA approved and can go in the dishwasher and the microwave safely, plus there are different models for both left- and right-handed children. Some kids will find the design strange and refuse to use it. Moms who are more worried about their cash flow than what their baby’s spoons are made out of will appreciate the affordability of plastic spoons. When you use plastic spoons, you don’t have to worry about how well they are holding up or misplacing them — they’re so cheap you can simply replace them. Don’t let the name fool you. These hold up well, wash after wash. But for a dirt cheap price, you get 16 spoons. So you can just shrug your shoulders if you lose one and go about your business. A big pack for such a low price would have been nice when I was a new mom. Trying to keep track of all my baby spoons was a nuisance. They would get shoved down to the bottom of my diaper bag and I would spend way too much time unpacking it just to find the spoon so I would have enough for a day’s worth of feeding without having to do dishes constantly. 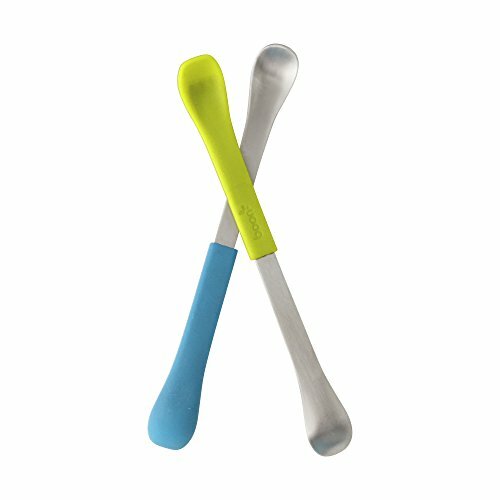 While these brightly-colored spoons are nothing fancy, they are durable, dishwasher safe, BPA free and the perfect size for a baby’s little mouth. A lot of spoons at a very affordable price. Since they are a little deep, your baby may have trouble getting all the food out of it. When your baby is just starting to feed themselves, plastic spoons are ideal as they're less likely to damage their gums or baby teeth. But older children who've been self-feeding for some time may feel more comfortable with smaller metal utensils, and may also want a spoon or fork that looks just like mommy's. Consider baby-safe stainless steel items to transition older toddlers to grown-up utensils. Some toddler utensils are designed purely to look cute, but can be uncomfortable or downright dangerous to use. This set, however, has been designed to be gentle for toddlers. 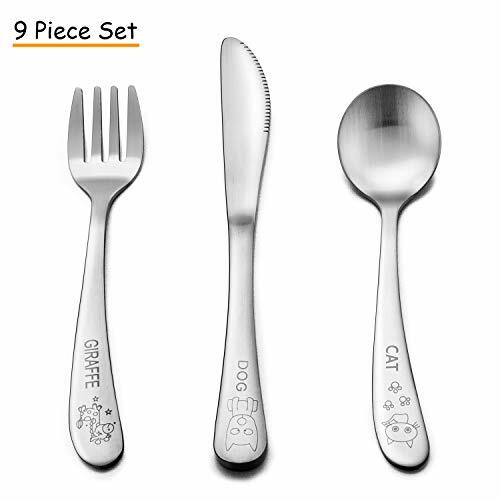 You get 3 knives, 3 spoons and 3 forks all made of durable stainless steel that’s non-toxic and easy to clean. Lots of care has been taken to make sure every edge is smooth and won’t cause any damage. If your toddler already has an impressive set of chompers, it’s OK to introduce harder cutlery and see how they fare. They might appreciate graduating to a more grown-up looking set. Engraved patterns won’t fade away. Because they’re not sharp, the tines on the fork don’t “stab” food very well. The matte finish can look dull with time. A breastfed baby will make it through the first months of life never having to deal with anything tougher than mom's breasts. This means spoon feeding can be a bit abrasive for little ones. If your toddler is a clumsy feeder or you find them hurting their mouths or gums on other baby spoons, you'll appreciate a model that's designed to be ultra gentle on delicate mouths and gums. These silicone spoons from Burabi are super soft-tipped, with a texture that’s flexible enough to be kind to gums but firm enough to get the job done. Both the handle and the scoop are flexible, and BPA free. The set is a pack of 4 in two spoon sizes: a shallower, larger handled one for mom to use, and a deeper, shorter handled one for when baby starts self-feeding. This allows you to tailor your feeding to match where your toddler is in their development, all while being careful with their gums. There are measurement markings on the scoops. Comes with a great warranty. Can be used as a teether. Clear silicone can get discolored with time. Might get small cracks after repeated dishwasher use. Things designed for toddler use are invariably chunky, brightly colored and a bit goofy looking. But if you're still spoon feeding your baby yourself, there's no need for a big, clunky spoon. A longer one with a small scoop may give you more control and precision as you try to get at least half of their food into their mouths and not all over the bib! These simple spoons are not like others in that they’re a lot more streamlined and narrow. Their longer length is ideal for feeding your child and making sure they’re making as little mess as possible. They are actually a 2-in-1: flip it over to select between the plastic or the metal end, depending on your needs. Experiment to find out which side your baby prefers, or change it up according to what you’re feeding that day. These are also on the smaller side where the scoop is concerned, which may be some babies’ preference. Flat tip makes it easy to clean food away from the side of your baby’s mouth. Slightly angled tip allows you to scrape food out of containers or bowls easily. Some parents find the angle too steep, causing the spoon to be tilted vertically when in baby’s mouth. Make sure to wash the new spoons you buy your baby before the first feeding. Before you start, you’ll want to make sure your baby is actually ready for spoon feeding. Generally, if your baby is watching every move you make when you have a piece of food in your hand and is reaching for it, they’re ready. When you first introduce a spoon to feeding sessions, you’ll need to feed your baby, as they won’t be ready yet to do it on their own. Make sure they’re sitting upright, strapped into the high chair, then place the spoon with food on it at the top of their mouths. You don’t want to jam the spoon in too far because you’ll make your baby gag. Don’t feel like you need to overload the spoon either — you don’t need a heaping pile of food. Offer just enough to keep your baby interested. Feeding isn’t a race, even though sometimes you’re strapped for time. Gently guide the spoon into and out of their mouths again, and don’t worry if a lot of it ends up on the bib! Babies will eat an amount that seems minuscule to you, but it’s OK to set the bowl aside once they’ve truly lost interest. Just remember in a few short months, they’ll be yanking that spoon out of your hand and you won’t have the luxury of getting to feed them anymore… so enjoy it while it lasts! Typically, weaning is best started between 4 and 6 months of age, right around the time your baby is starting to get their first teeth. Your baby has grown used to eating by pushing their tongues out to latch onto your breasts, but when they wean and eat solid foods, they’ll have to learn to maneuver their tongues inward. They have enough muscle strength to hold their heads upright. They’re four months or older. They’ve begun putting toys or teethers into their mouths. They seem interested in what adults are eating. Adults take it for granted, but controlling a spoon successfully is no mean feat! Self-feeding with a spoon is one of those milestones that varies a lot between children. It’s important to remember that mastering spoon skill is not done overnight; rather, you’ll see your baby make gradual improvements over time. Some toddlers will start trying to do it themselves around the one year mark, although they often won’t be very successful! Let your child tell you what they’re ready for and when, as we all develop at our own pace. They may need your help for a while and then master self-feeding all at once, or they may start early on but need more of your assistance as they fine-tune their motor skills (source). Whatever the case, don’t worry too much. Children invariably learn to use utensils by around 18 months and by the time they’re 3 or 4 years old, they’ll have good control and can learn other table manners. Baby Pinch Boutique bamboo spoons are at the top of my list. They are easy for your baby to use and the best part is that they are made of safe materials. I don’t want to worry about my baby ingesting harmful chemicals with each bite of food. These offer peace of mind, which to me is well worth the higher price. Plus, I absolutely love the wooden box that it comes with! What about you? What are your favorite baby utensils? Do you have any baby weaning advice for moms with little ones just starting on solids?